In The Future of the Global Economy: Meeting of the Minds (2010), global business and government leaders are asked the same question: is there a better model of free-market protections adequate for actionable response? Amid the global economic crisis of 2008, the emergence of criticism surrounding market risk and government responsibility to companies, consumers, and the environment placed new emphasis on regulatory reform and policy solutions meant to buffer investors from the perils of unscrupulous financial practices. In an era when “hands off” governance of the market led to default of major financial institutions, investors alleged that their funds were stolen through permissive rules to securities contracts and transactions. The film addresses the convergence of economic environment, corporate, and regulatory values, and looks at how a new regime of investors obliged to the ethics of corporate social responsibility (CSR) in strategic decision making where human capital is concerned. Investors are also portrayed as the advocates of economic rights: establishing a new paradigm focused on market distribution, and tighter restrictions on financial mechanisms and institutions. Is it possible to transform the economy through an ethical response to market relations? Are new investment models and regulatory rules the practical solution to global reform of economic inequities? Is current economic policy adequate to address devolution of the market? Film panelists include representatives of the FDIC, Dow Chemical Corporation, and Standard Chartered. 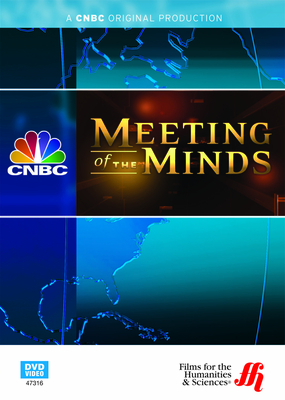 One of the series, Meeting of the Minds: America's Economic Future, the film promotes participatory decision making in the rules to market exchange by investors, corporations, governments, and citizens.